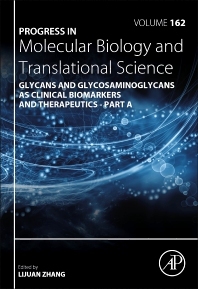 Glycans and Glycosaminoglycans as Clinical Biomarkers and Therapeutics - Part A, Volume 162 in the Progress in Molecular Biology and Translational Science series provides informative monographs on a variety of research topics related to Glycans and glycosaminoglycans as clinical biomarkers and therapeutics. Topics in this update include Glycan-based Biomarkers for Diagnosis of Cancers and Other Diseases: Past, Present and Future, Desialylation in Diseases and its Application in Diagnostic and Therapeutic Development, Proteoglycans as Miscommunication Biomarkers for Cancer Diagnosis, Fucosylation in Cancer Biology and Its Clinical Applications, Retrospective Analysis of Glycan-Related Biomarkers Based on Clinical Laboratory Data in Two Medical Centers, and many related topics. Lijuan Zhang is a Professor of Translational Medicine at Ocean University of China. She completed her doctorates of biochemistry and molecular genetics at University of Alabama at Birmingham in 1995. Before then, she was a Fogarty International Fellow at NIH for three years studying glycan-based cancer biomarkers. She worked as post-doctorate fellow and research associate at both MIT and Harvard Medical School from 1995-2002. She joined the faculty of the Department of Pathology & Immunology at Washington University in St. Louis in 2002 as a tenure-tracked Assistant Professor. Her research had been focused on the biosynthesis, structures, and biological functions of glycans since 1985. Now her work is on translational aspects of glycans as biomarkers and therapeutics. She has over 60 peer reviewed publications. She edited and published a book entitled “Glycosaminoglycans in Development, Health, and Diseases” with the contributions of top scientists worldwide in 2010 by Elsevier.